Tex Mex Chocolate Cookies — Blast from the Past! Tex Mex Chocolate Cookies are a family favorite, and since the cold weather has bolstered our cravings for warm flavors, I made a batch yesterday. They’re so good! I used to make these cookies all the time, but at some point I took a break and during the break the recipe just fell by the wayside. Glad it’s back in the picture because people really enjoy these. I’ve mentioned a few key points in the recipe notes section, so take a look at those before you proceed. For instance, natural cocoa will give you a slightly thicker, lighter cookie because the acidity in the natural cocoa reacts with the baking soda. If you use Dutch process, you’ll get a delicious but slightly flatter cookie. I use unbleached flour for the most part, but I think bleached flour will also give you a slightly puffier cookie. And of course, chilling the dough longer than the requisite 15 minutes (which is really just to make it workable) will give you a nicer shaped cookie. 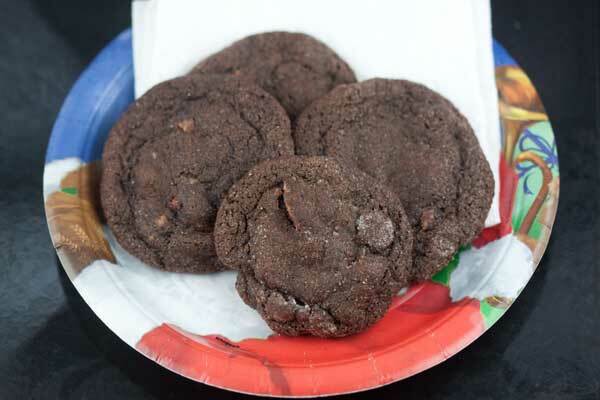 Tex-Mex Chocolate Cookies are deep chocolate cookies infused with the warm flavors of cinnamon, chipotle and nutmeg. Mix the flour, cocoa, baking soda, salt and spices together in a medium bowl. In a mixing bowl, beat the butter with both sugars, honey and vanilla. Add eggs, one at a time. With a silicone scraper or large mixing spoon, gradually add the dry mixture (or use the paddle of a stand mixer set on low). Stir in pecans and chocolate chips. Chill batter in refrigerator for approximately 15 minutes. Preheat oven to 375 degrees. Line two baking sheets with parchment paper or foil. Do not use cooking spray. Scoop up slightly rounded tablespoons of chilled dough and shape into 1 1/2 inch balls. Roll the balls in cinnamon sugar mixture. Bake for approximately 10 minutes or until outer surface begins to crack. Let cool on baking sheet for about 3 minutes, then transfer cookies to a wire rack and let cool completely. If you don't weigh your flour, make sure to stir it very well before measuring. For the cocoa, natural style (e.g. Hershey's) works best. Dutch cocoa is acceptable, but the cookies will be thinner. Instead of rolling the dough into balls right away, I sometimes plop rounded tablespoons of dough onto a foil lined baking sheet and chill the baking sheet with the portioned dough pieces for about an hour. That gives me time to clean up the rest of the mess and come back to the cookies later. When I'm ready to bake, I just roll the portioned dough pieces between the palm of my hands, roll in sugar and bake. Carol, they are a little spicy. It really depends on how robust your spices are and how fresh the chipotle powder is. A good substitute would be a pinch of cayenne. Are these cookies spicy? I never use chipotle powder. Is there a substitute? Do you taste the chipotle? Thanks for the comment! This is one of my all-time favorite recipes, for sure. These are AMAZING! I have made them 5-6 times in the last year and folks love them! I love makng these for people. They are always a hit.